But as I look back on my college years, I can now clearly see the mistakes made and lessons learned. In this post, I’d like to share with you some of these lessons, in hopes that they help you in your academic and professional careers. One of the greatest lessons you learn in school has nothing to do with the course material. It is the ability to organize, prioritize and juggle many different things at once. A list-lover, organization was never really a problem for me. I’m the type of person who takes great pleasure in creating schedules and lists, and then feeling an outstanding sense of accomplishment after crossing tasks off. However, I know that not everyone is like me. Some people have a very difficult time keeping track of deadlines, project specifications, etc. That’s okay! Not everyone is born with a Type-A personality (which is probably a good thing, ha-ha). Take the time while you are still in school to learn how to become as organized as possible. At the beginning of the semester, review all of your syllabi and make a calendar. Highlight all important dates- tests, quizzes, due dates, etc. This way, you have a clear idea of when you will be busiest. If you have three projects due on the same day, you’ll know that you will need to start working on them in advance to avoid a caffeine-induced all-nighter. If you are in design school right now, you know that research is a crucial part of the design process. Or at least – that’s what your professors tell you. 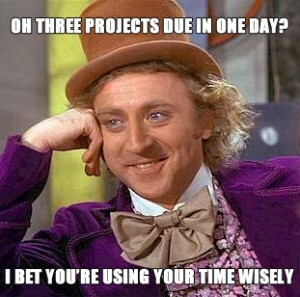 Truth be told, I was one of the students who would often skimp during the research phase of a project. This wasn’t because I didn’t care; it was simply a time issue. If I could go back and do it all over, I would have more thoroughly researched, mind-mapped, surveyed, sketched and mocked-up before I moved to the computer. There really is no excuse for this. The computer is a tool to aid designers. You should stay out of Photoshop and Illustrator until you have a clear idea of what your concept(s) will be. But I was young, and inexperienced, and we all make mistakes. I now understand the importance of research, and have come to embrace it as a major part of my process. When I was in high school, I remember a single tip being drilled into my head over and over: be well rounded and you’ll be able to get into a good college. While a college acceptance most certainly takes more than just this, it is still good advice. Colleges want students who are well rounded, and so do employers. In college, you have the opportunity to take almost any class that you want- within the restrictions of the degree requirements. Don’t limit your knowledge to classes on art and design. Take classes on communication studies, psychology, gender studies, etc. By gaining knowledge on these subjects, you gain a better understanding of your audience and how to better reach them. Knowledge like this will definitely help you on future projects. In addition, taking classes that may be outside your major or minor will likely introduce you to new people and encourage networking. Also, college is one of the last opportunities you will have to learn about subjects you’re passionate about in a facilitated environment. You are paying the tuition, why not make your stay as enjoyable as possible by taking classes that you’re interested in? Believe me, I’ve been there. When I was in school, I worked at a restaurant full-time, took a full course load every semester, worked for my school’s radio station, and wrote articles for the school paper. However, the summer before my last semester, I began looking for internships at marketing firms and design companies. By May, I had added 25 hours of interning to my already supercharged schedule. Thinking back, I honestly don’t know how I did it. The math truly just doesn’t add up. But I did it, and I’m so happy I did. Completing an internship while I was still in school – although it was exhausting – was completely worth it. At graduation, when most of my peers were discussing their plans to begin job hunting, I had over 6 months of experience under my belt, and more importantly, a full-time job. Do you remember how I mentioned earlier that I wish I would have done more research before completing my school projects? This is why. Sometimes, I would get too wrapped up in completing the project and getting the grade, that my work wasn’t as tight as it could have been. Towards the end of my schooling, I found that although my GPA was high, my portfolio reflected my sometimes hurried executions. Had I done the research and then spent the time refining the work, my portfolio would have likely been more impressive much sooner. Eager to improve my portfolio, I took on several independent projects. I asked professors for extra credit, did freelance work, and even reworked previous projects. The goal here wasn’t necessarily to make money or better my grades. The point of this was to enhance my portfolio so I would be able to demonstrate my absolute best work to future clients and employers. Believe me, I know you’re the stereotypical broke college student. You eat ramen noodles at least twice a day, you let your gas tank run below “E” for at least 25 miles before refilling, and you search between couch cushions for coins to feed the washer and dryer. But understand that your professors give you a supply list for a reason. One semester, I had the opportunity to take Two-Dimensional Design. I remember the first class vividly. There were about 25 people sitting on stools around square, high-top tables waiting for the syllabus to be handed out. The syllabus was distributed, discussed and I’m pretty sure we all expected that to be the end of the first class. After the syllabus came a 5-page, single-spaced sheet. On it, a list of necessary supplies for the semester. Some things I’d heard of – pencils, crayons, Bristol paper – and others were completely foreign – Yasutomo Japanese Printmaking Paper? A Speedball Linoleum Cutter? I was further discouraged when I began to shop for all of these supplies, the grand total well over $300. Needless to say, that 25-student class dwindled to 12 by the second class, and shrank to 3 by the final. But am I glad I spent the money? Absolutely! I learned so much that semester! From color matching to print making, I covered subjects I had never even heard of, making my college experience more unique, and expanding my range of knowledge. In college, you are constantly surrounded by inspiration and other creative individuals. Now is the best time to begin branding yourself as a designer. Start by designing your logo, then move on to a website design. Ask your peers and professors for their thoughts on the design. After refinement, make sure it is consistent and reflects who you are. Just as you research before beginning a design for a client, do the same for yourself. Decide how you want to be portrayed, and what audience you’re designing for. As you may or may not already know, Google know displays authors next to their written content online. For example, here is one of my articles below, with my photo next to it. 150%?! Think about how an employer might be affected if they Googled you. How would you measure up against your competition? The answer is simple: if your photo comes up, with great content attached, and theirs doesn’t- you win. For more information on MicroData and Google Authorship, check out this article. Gone are the days where most companies ban Facebook or Twitter in the office. Some companies, like Optimum7, actually encourage interaction on social media. Just as building your authorship on Google is important, so is creating a valuable following across all social media platforms – especially Twitter and LinkedIn. In order to do this, you’ll need to take that logo you made during the “Brand Yourself” stage of this article, and add it to your Twitter and LinkedIn. Next you’re going to need to take that valuable content you’ve created during the “Sign Up For Google Authorship” phase and share it like crazy! Interact with your followers, be respectful, answer questions, ask questions, and become a valuable member of the community. Be sure to follow your favorite designers, and read what they post. We are lucky enough to live in an age where we can ask designers in Australia their opinion on a new technique, and get their response in minutes! Take advantage of your predecessors and the new technology to make yourself a better, more informed designer. More often then not, my memory fails me, and that fleeting moment of genius vanishes forever. By keeping a sketchbook and pencil with me at all times, I increase the chances of actually remembering my ideas. And when you’re sketchbook is full, you throw it away right? No! You keep it! So many times, I’ve gotten stuck with a logo or a website design, and solved my creative block with a flip through my mini-library of ideas and doodles. You never know when you may be able to apply an old concept to a new project. Although the prices of art supplies and equipment can quickly add up, it is important to think of the supplies as investments. You need to think the same way about design books. Although we live in a very tech-driven age filled with tablets and e-readers, nothing beats the smell of a great design book. Again, when I am searching for inspiration, I reach for my old textbooks- Alina Wheeler’s Designing Brand Identity is one of my favorites, and definitely worth a read. While some professors are better than others, you will find that the experience with both will prepare you for the real world of client relationships. Professors can be good or bad, critical or nonchalant, agreeable or disagreeable- just like you will find your clients to be. My best advice is to deal with the disagreeable professors with a grain of salt, and to latch on to the professors who are truly great. The best professors are often the ones who have experience in the field. They know what clients look for, what questions you should ask, and how to handle heavy workloads. Listen to them, pick their brains, and ask their advice. I remember my first college-level graphic design class critique vividly. We were required to stand in front of the class, present our work, explain our reasoning, and answer questions from our professor and peers. Truth be told, it really wasn’t that bad. I attended a relatively small school, and was pretty close with all of my classmates. I soon learned that the critiques were not nearly as harsh as I had imagined. But perhaps they should have been. Looking back at some of my work, I wish that someone would have stood up and pointed out all the flaws! It would have made me think more critically, challenge my design and myself, and ultimately make myself a better designer. During your critiques, be honest with yourself and your classmates. Offer constructive criticism and reasoning for that criticism. Ask questions. Your peers are likely to reciprocate. By taking more initiative during these critiques, you will ultimately gain more awareness as a designer and prevent yourself from repeating the same mistakes. Like many things, your experience in school will directly relate to the amount of effort you put in. With a good attitude, some hard work, and a lot of coffee you can achieve almost anything you put your mind to. Set your goals and work toward them each and every day. Don’t let anyone or anything stand in your way. Interested in gaining experience in design and marketing? Contact Optimum7 today for more information about our internship program!